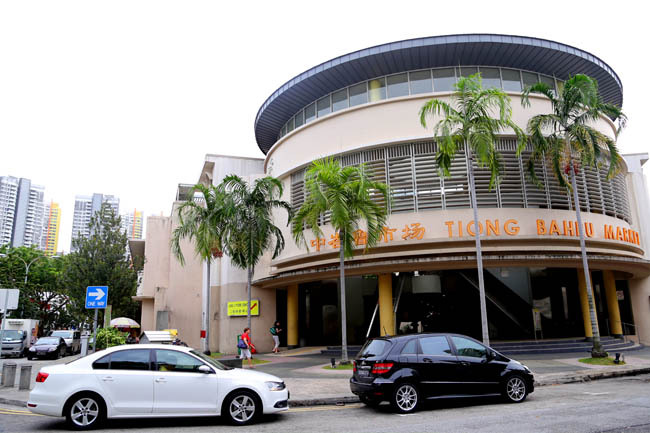 Tiong Bahru Market & Food Centre has been one of Singapore’s favourites, and in fact the the first modern market to be built in a housing area in 1955. 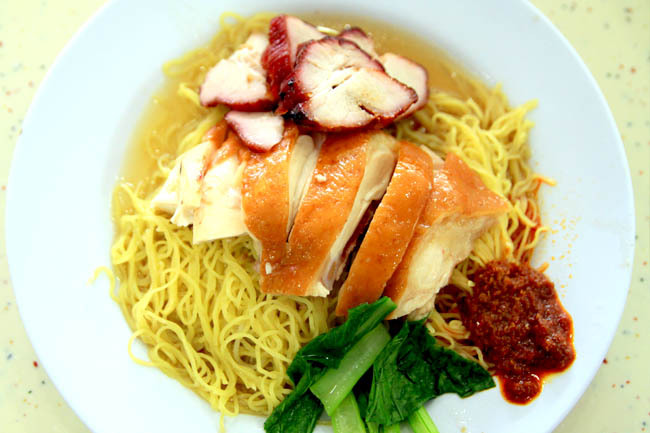 Several well-known food items have in fact been synonymous with the name “Tiong Bahru”, from chwee kueh, pao, porridge to roast pork. 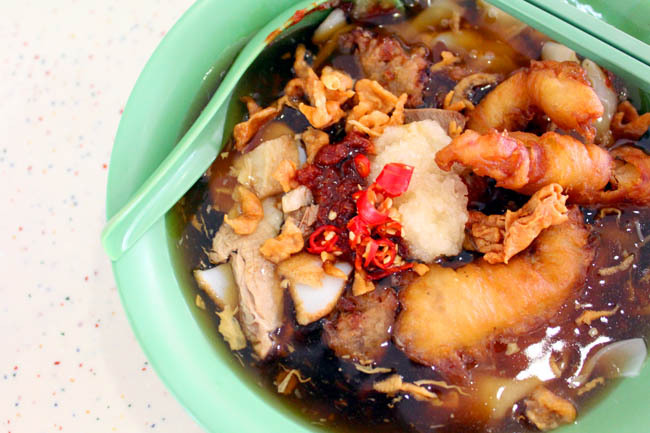 Talk about best stalls, and there are too many to choose from, such as Lee Hong Kee Cantonese Roast, Long Ji Soya Bean Drink, Tiong Bahru Fishball, Tiong Bahru Pau Yi Sheng Hokkien Mee to Koh Brother Pig’s Organ Soup. 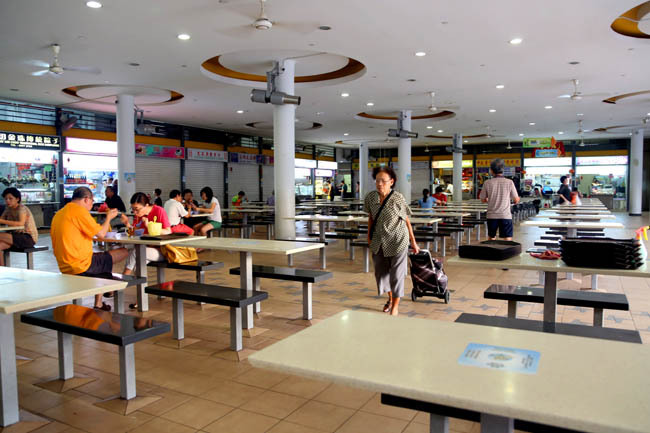 I thought I should just document some 10 favourite stalls from Tiong Bahru, since this is the food centre I grew up with. The decision is tough though. 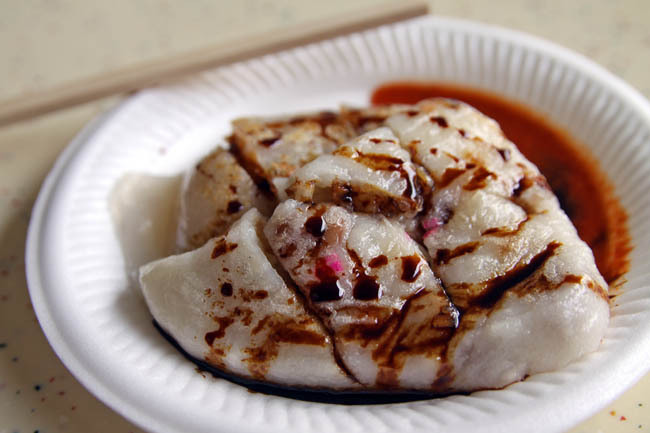 Many Singaporeans would agree that Jian Bo offers one of the best chwee kueh around, a simple dish of smooth and soft steamed rice cake topped with oily preserved radish. While quality has dipped over the years, Jian Bo’s ‘cai po’ remains robust and tasty, matched with tasty chilli with hints of dried shrimps. They should go easy on the oil though. Not a widely publicized shop, but its queue in the morning easily beats many of the other popular stalls. One word – the sauce. The old uncle whips on a bowl of QQ noodles basking in an extremely delicious and unique-tasting sweet and salty sauce with crunchy pork lards. This is a handmade fishball noodle stall I would almost return to again and again. And again. Never mind that auntie always look grumpy in the morning. They are famous of their ‘bu jian tian’ char siew, literally roast pork that doesn’t see the sky. That is because the meat is taken from the arm pit of the pig, thereby being tenderer than the other parts. The charred roast pork is indeed on of the best. Do queue early before it’s sold out. The signature is the deep fried shark fritters with crispy batter bits. Yes, shark meat. The boss of the stall take special pains to entire the shark meat is not overly fishy. I also like that the gravy is not overly starchy or rich, yet slurp-worthy. 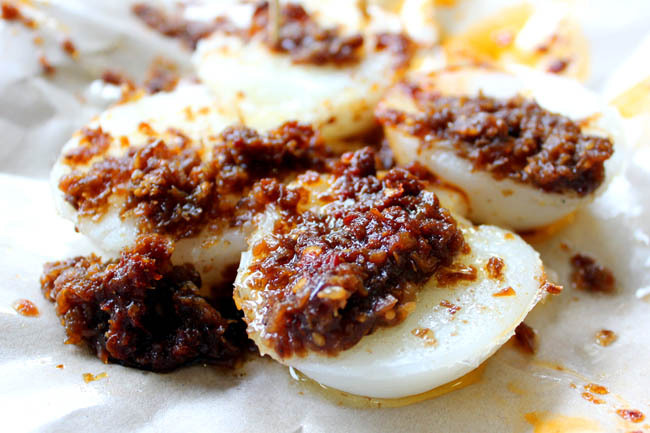 This Teochew kueh stall sells a wide variety of traditional cakes, such as peng kueh (glutinous rice cakes), soon kueh (rice flour cake with turnip), ku chye kueh (rice flour cake with chives), and the rare ou kueh (rice cake with black bean). Since its opening in 1974, the stall has been using the recipes handled down by the owner’s mother. Their offerings are very homely-tasting, as though it’s made by your favourite aunties. Tip: request for pan-fried versions of the cakes. Uncle knows my order already. I am regular because their ‘tau hway chwee’ is so fresh and smooth tasting, laboriously prepared in the wee hours of the morning by the friendly husband and wife team. 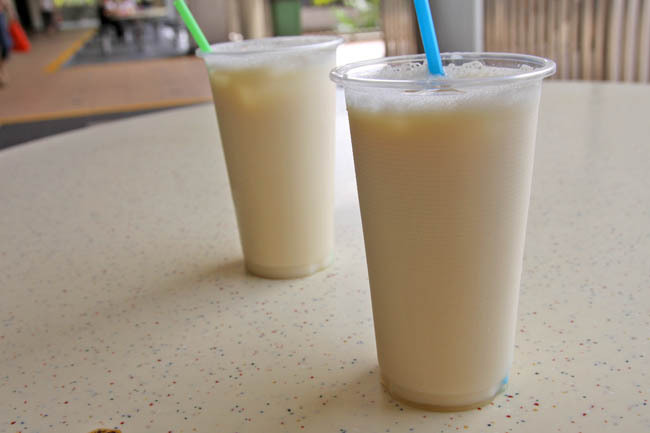 Their ‘Michael Jackson’, the combination of soya bean milk with glass jelly is very popular too. Their queue is long, but it moves fast. There are so many coffee stalls at Tiong Bahru Food Centre, and you wonder why people would choose to queue at 238. After all, it’s just kopi right? 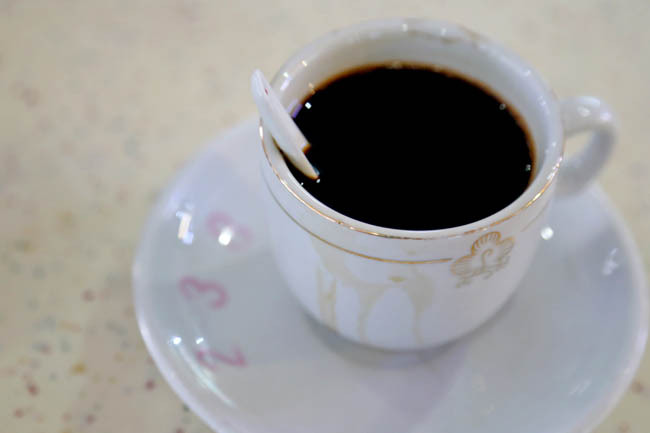 Their kopi is especially aromatic, and the blend is stronger and sharper than usual stalls. After sips, the coffee-bitterness would linger in your tongue. Watch the skillful auntie in action. 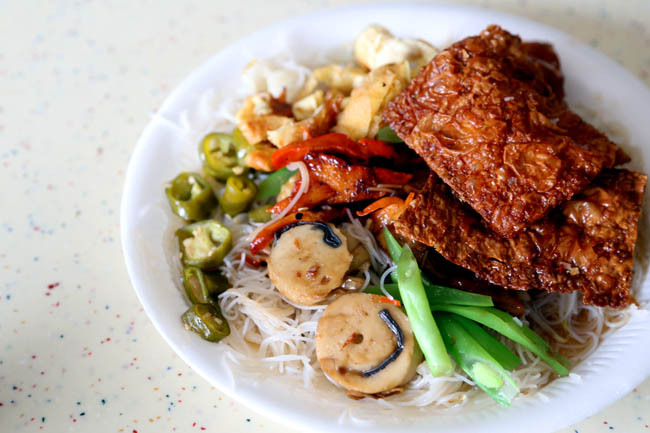 Ru Yi vegetarian bee hoon looks so plain and simple, that you wonder why the long queue. It being more than 30 years in the business should mean something. 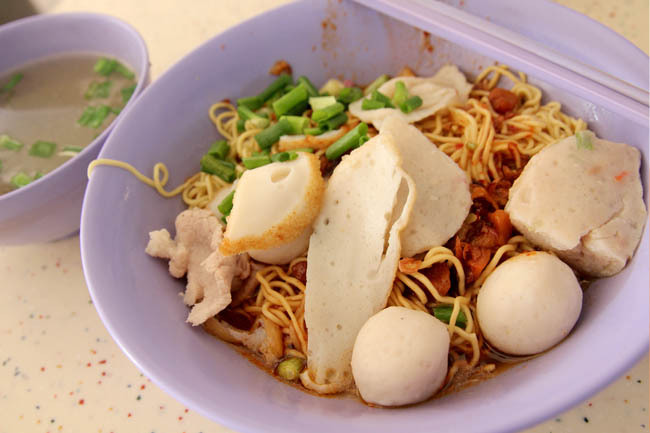 Then you would realize it is not as oily as many other bee hoon stall, clean-tasting and doesn’t make you feel bloated. The mild gravy and pickled cut green chilies complete the plate. $2. Yes, still $2 per plate. Fried by an old uncle since the old Tiong Bahru market days of more than 40 years, uncle keeps his kway tiao quite ‘unoily’, better for them who wants a ‘healthier’ and drier version. The $3 and $4 versions are better in my opinion, with more generous portions of cockles, sliced fish cake and Chinese sausage, matched with a tinge of spicy chilli sauce. 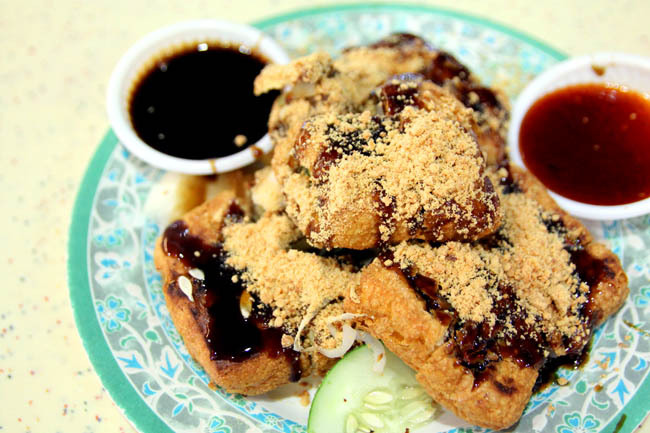 The ‘tow kwar pop’ (like a beancurd puff) is grilled on charcoal upon order, filled with cucumber and beansprouts, and served with cool turnip and pineapple slices on the side. The winning ingredient is the sweet prawn paste sauce poured over, with a dash of peanut. Very old-school! 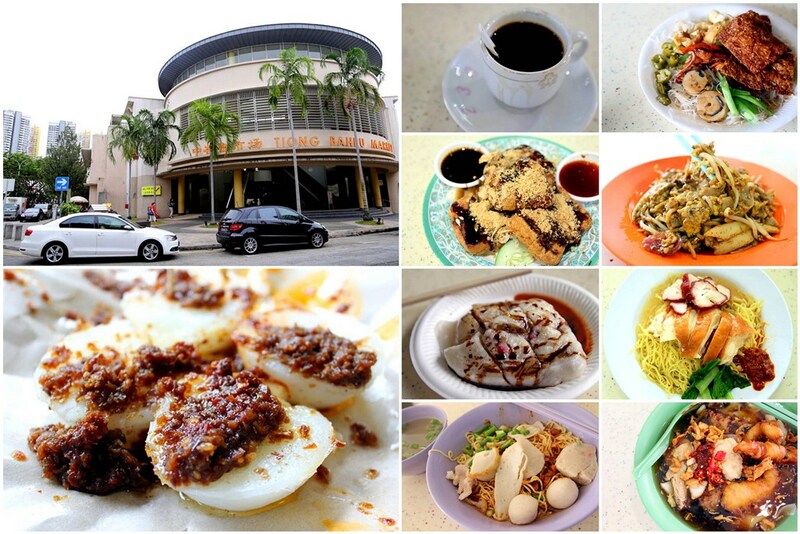 Which is your favourite stall from Tiong Bahru Food Centre and why? 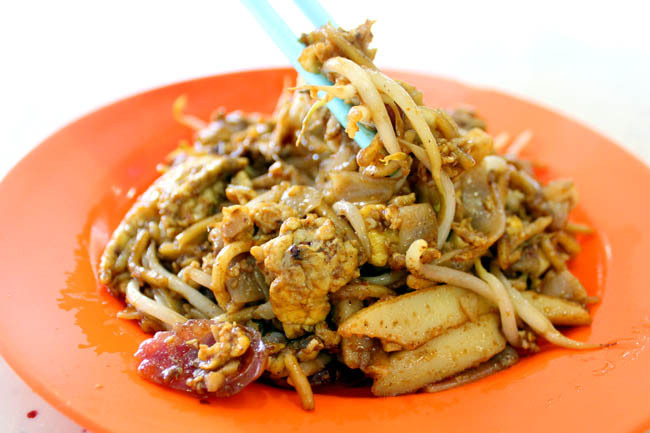 ← Segar Restaurant – Halal Zi Char with $10 Curry Fish Head! That 163 porridge stall . Their raw fish is nice! Not a fan of pig organ soup? Are they open on monday for breakfast? All the stalls? Not all. They open at varied hours and some may close as and when. Prawn noodle at #02-31 is nice. Wanton noodle and dumpling soup at #02-24 is good too.